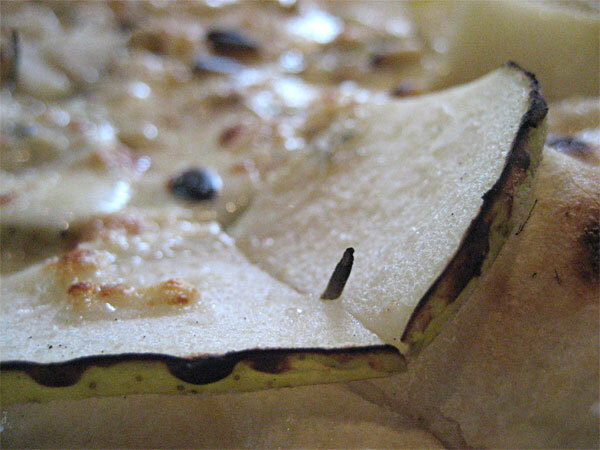 Stop 50 Woodfired Pizza has developed a well-deserved reputation worthy of a LTH Great Neighborhood Restaurant Award. Since discovered by the LTH community from this post Stop 50 has maintained consistently excellent reports by a variety of diners over the past year. Pigmon and Trixie were the first to dine as they reported here. Coincidentally my wife and I dined a couple of hours later and posted our experience. 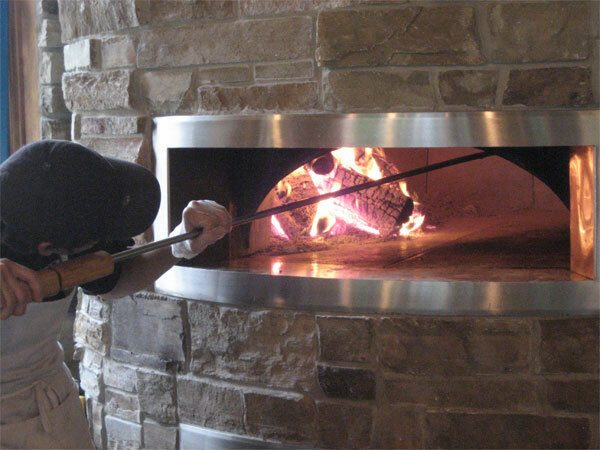 An LTH event was held at Stop 50 Woodfired Pizza earlier this year where we were well fed as reported byCathy2. Several other members have also reported their positive experiences during the past year that shows the friendliness and consistency of a neighborhood restaurant that is deserving of a LTH Great Neighborhood Restaurant. 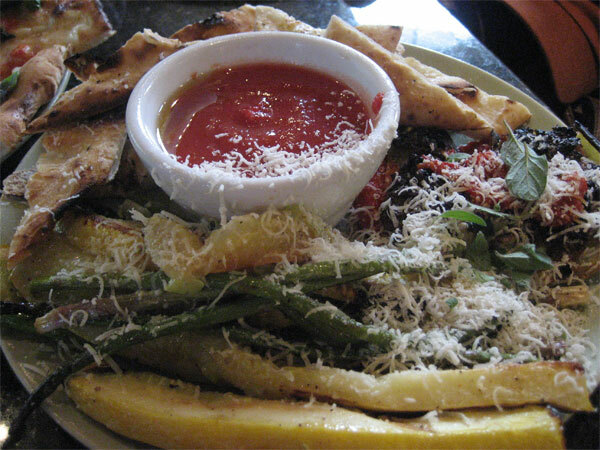 Besides the great pizza, Stop 50 Woodfired Pizza has a variety of outstanding appetizers, desserts, and salads that have been favorably reviewed in the Stop 50 Woodfired Pizza thread. Stop 50 uses the freshest local ingredients which take great food and make it better. The Bardol's adapt the menu to the season and are very creative in adapting ingredients to their unique restaurant. 500 S. El Portal Dr. This is a great nomination and, if confirmed, Stop 50 would be our first out of state GNR. I second the nomination. I third it! My thoughts are contained in the post. But a few minutes later we saw why that factoid was relevant-- our pizza did, in fact, get a few moments of finishing up in that steelworks heat, and emerged from the oven trailing smoke like Chuck Yeager after hitting the eject button. Another factoid mentioned along the way was that the crust comes from a 10-year-old starter. That led me to expect maybe a little more tang to the crust than it had, but otherwise this was a wonderful crust-- crispy outside, fluffy inside, little burnt bits which added flavor almost like a seasoning does, a deliciously scarfable platform for superior toppings. With about 1/1000th of the hype that Crust has put into being the first organic pizza (excuse me, flatbread) place in the universe, Stop 50 demonstrates a comparable commitment to high quality, natural locally-sourced ingredients by-- this is so far out-- growing some of them themselves. Now, I know you're saying, how can I be sure my pizza is natural if the owner doesn't have to fill out tons of paper, document the source of every ingredient, and get it blessed by the EPA and Academy-Award winner Al Gore? Well, Stop 50-- this is just so radical you won't believe it-- just figures you'll taste the difference. Whoa. Sarcasm off, the freshness and flavor of the toppings was really stellar, like the little fuzzy leaves of fresh-picked sage on a pizza covered with brightly flavorful sausage (I asked about that and he said they get natural pork sausage from Chicago but season it up a little more themselves). I admit this appetizer plate, with its big cup of tomato sauce (refrigerator-cold, in the meal's only real misstep) and heavy dosing of parmesan, looks like something out of Macaroni Grill. But again, ingredients make the difference-- the vegetables were flavorful and nicely grilled, and the pepper stuffed with sausage (unrecognizable at right) was outstanding. We chatted with the owner (when his pizza-making permitted) and mentioned that we knew Bruce-- happy birthday, Bruce! Enjoy the cake! 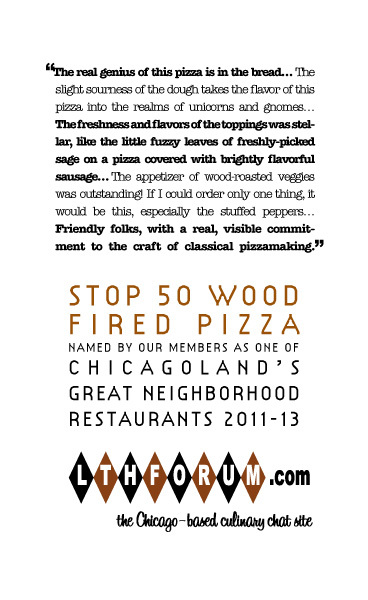 Friendly folks, a real and visible commitment to the craft of classical pizzamaking, outstanding pizza right at the top of greater Chicagoland's burgeoning Neapolitan-style pizza scene-- this is a great neighborhood place and well worthy of extending our definition to take in the vacation communities mainly frequented by Chicagoans around us. I ate this meal with Mike G and want to highlight his take on the fresh ingredients. His picture of the appetizer shows the wonderful zucchini--it is some of the best zucchini I have ever had (and it is one of my favorites; my mother's best friend grew zucchini in her garden and even wrote a zucchini cookbook, so I have a lot in my time). I heartily concur with Bruce's nomination. Now, maybe I'm influenced by the fact that Stop 50 was there for me on the long road back from Detroit while Crust had to shut down for re-jiggering the day I tried to go, but that above just makes me want to rant! There's been some scuttlebut on the web on organic vs. local, and as the How to Eat Local thread has shown, there's a bit of backlash in general on the eat local thing, but damn glad it, what really matters. I wish Crust would pay more attention to getting real food not approved food. OK, you got my vote for Stop 50, a neat place! We stop here once a year on our way to Ann Arbor. I fully support renewal. The pizza is stellar. If it were in Chicago, it would probably be my second favorite. While I've only had one or two appetizers, they were excellent, showing that care is put into all the food served here. The owner is so friendly that he actually recognizes us from our annual visits, and clearly cares a lot about what he puts on the table. To me, it has everything a GNR should, so long as we extend our "neighborhood" to the Indiana shoreline. Stop 50 is aptly named as it has functioned as a great mid-way lunch point en route or return from Michigan and the Indiana shores. Pistachios were new to me on pizza, but the prosciutto is a go-to as is the the parmigiano which both feature the little green nut as a dense crunchy counterpoint to the perfectly charred crust. I have also very much enjoyed the wood-fired pizza breadstick with goat cheese and an addictive dipping sauce as well as the sausage-stuffed peppers. The wild mushroom pizza is another favorite. This place is a quiet turn or two away from anything resembling bustle so it serves as a nice respite from a driving trip. I look forward to my next trip East so I can conveniently drop in again. I support this renewal as well. The daughter and I have occasion to drive east a few times a year (sadly and happily this tradition is coming to an end). After stopping at Stop 50 on our drive last summer, when we were planning our drive last month she had one question about our departure time - "what time does that mean we will get to Stop 50?" I sadly had to inform her that we were not stopping because they would not be open. As if dining among the potted herbs that find their way onto my pizza on a beautiful summer day was not enough, the pizza was excellent when fresh and sustained our snacking for a few hours until it was gone, at which point we both lamented our stupidity for not buying a couple more pies for the road. And the sweet memory has lasted even longer. We will be back again. I vote for renewal: my comments regarding a recent visit are here. Although Stop 50 is not so easy to find (mostly because my GPS provided misleading directions, believing there was a road when there wasn't), the two pizzas that I ordered were excellent. This is a definite stop whenever I am invited to Harbor Country. I heartily endorse this renewal. A post-camping stop on the way back from Michigan yielded a true hidden gem. The heirloom tomato special in August, with walnuts, gorgonzola and red onions was terrific. Don't skip the stuffed pepper appetizer. While I do enjoy the pizza there, what impresses me about Stop 50 is the freshness of all of the ingredients, the sausage stuffed peppers are terrific, and the creme brulee cheesecake is worth the drive by itself. Chris is a wonderful host and owner. I would like to see Stop 50 retain its GNR. I enthusiastically support renewal for Stop 50. 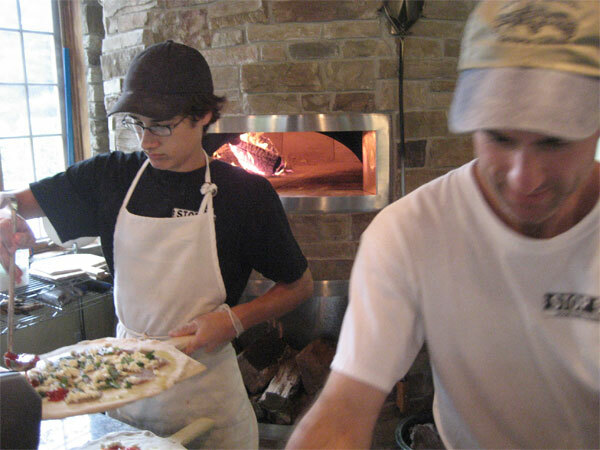 Their pizza is top-tier and the ownership is impressively focused on quality in every dimension of what they're doing. I wish Stop 50 were closer to the city. Based on a recent visit, I strongly support renewing Stop 50's GNR. The place continues to fire on all cylinders. 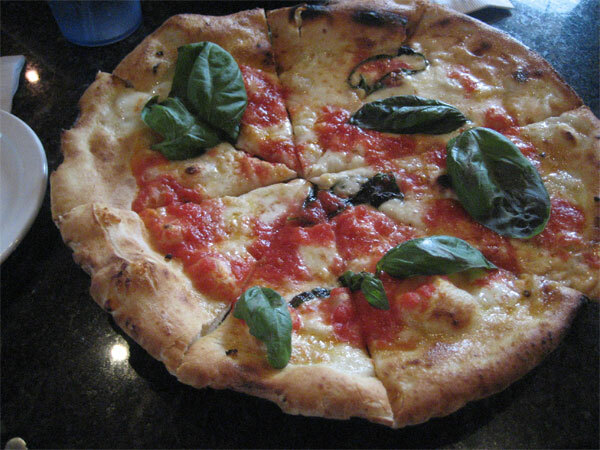 We also wholeheartedly endorse GNR renewal for Stop 50, one of the best Neapolitan style pizzerias in the country. We've been regulars there since 2006, and Chris, Kristy et al are still at the top of their game. We're going this afternoon as a matter of fact. Only downside is they close for the winter (so don't wait too long to go or you'll be waiting until Mar or Apr...). 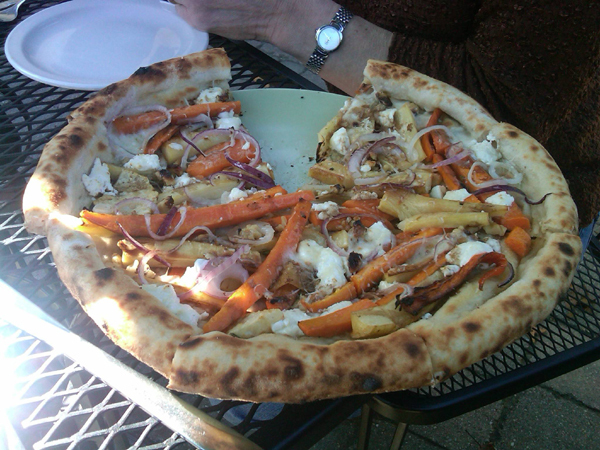 Roasted carrots and parsnips, a few nuts, some goat cheese and a hint of rosemary. This is a big time winner. When paired with the gorgonzola and pear, the current seasonal special, this was a heck of a lunch. Plus we sat on their lovely outdoor patio. Oh, of course this is a slam dunk renewal.